Restored as a family home by a wealthy Victorian, the castle offers the chance to explore medieval walls and towers in a setting of tranquil gardens and wooded Country Park. 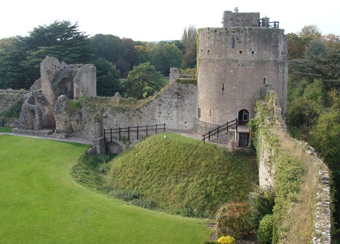 Caldicot has its roots in the past with its wonderful old castle built by the Norman's 900 years later the French built a stupendous new road bridge crossing the river Severn which now makes Caldicot the new gateway into Wales (second Severn Bridge opened 1996). During the first half of the 20th century Caldicot continued to grow steadily, but unspectacularly, reaching a population of 1,770 in 1951. Early in the 1950's, however, Chepstow Rural District Council decided that the village should be allowed to expand to approximately 3,000. Shortly after this decision, the government decided to build a new steelworks at Llanwern. Caldicot was designated as a suitable home for the thousands of steelworkers. Expansion plans were revised upwards. Llanwern steelworks opened in 1962 and by the end of the decade Caldicot was occupied by over 7,000 people and was still growing. The village was fast becoming a town. 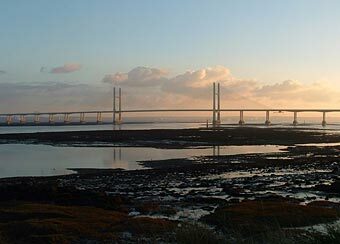 The growth of the community was furthered by the opening of the Severn Bridge in 1966, strengthening the ties between Caldicot and the Bristol region which have always been so important to the wellbeing of the area. With Caldicot now being part of the 'M4 Corridor' new industries such as Mitel Telecom came to the town, compensating for the contraction of the steel industry and the railways. With the construction of the Second Severn Crossing, Caldicot appears to be destined to continue its growth. In earlier years growth was achieved at the expense of the destruction of some of Caldicot's historic buildings. It is to be hoped that future development will take place in a more enlightened way, remembering that Caldicot has a proud past as well as a bright future.